There was a 30 minute stop in Hermosillo at the central plaza. The government building had some beautiful frescoes. Across the plaza was St. Augustine Cathedral. Hermosillo city, in northwestern Mexico, is the capital of Sonora State, on the Sonora River, at the mouth of the San Miguel River. Situated on the Pacific Highway 15 and the western coast railroad, Hermosillo is the trade center of an agricultural area that produces a great variety of tropical fruits, as well as cotton, wheat, sugarcane, corn, and beans. The mining area located to the east produces gold, silver, copper, and molybdenum. Industries in the city include metal casting, food processing, and the manufacture of cement, shoes, beer, and handicrafts. Hermosillo is the site of the state museum and the University of Sonora (1938). The city is connected by road with the fishing resort of Bahía Kino, to the west on the Gulf of California. Hermosillo (named in honor of the Spanish general Gonzales de Hermosillo) was established in 1700 as a Native American settlement called Pitic; the modern city was founded in the middle of the 18th century. During the War of the Reform and conflicts with the French in the mid-19th century, several skirmishes took place in Hermosillo. Population (1995) 559,154. 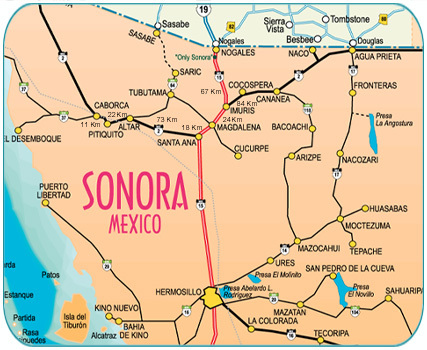 Hermosillo is located 173 miles from the United States border in the central part of Sonora State. It is also known as the City of the Sun. There is an impressive highway going directly to Hermosillo as well as leading to all the cities of the state.